See some of our Tiffany Antique Lamps and Lighting examples by clicking here. Fontaine’s Auction Gallery was founded over five decades ago, serving thousands of buyers and sellers throughout the world with the purchase and sale of fine art, antiques, jewelry, and Tiffany lamps. With extensive knowledge of market conditions and international experience, the specialists at Fontaine’s work closely with collectors and consignors to provide the highest quality of service. Fontaine’s has the best rates in the auction industry, and all consignments are fully insured. Louis Comfort Tiffany’s Tiffany Studios first introduced their leaded glass lamps in the late 1890s, still appealing to collectors around the world. 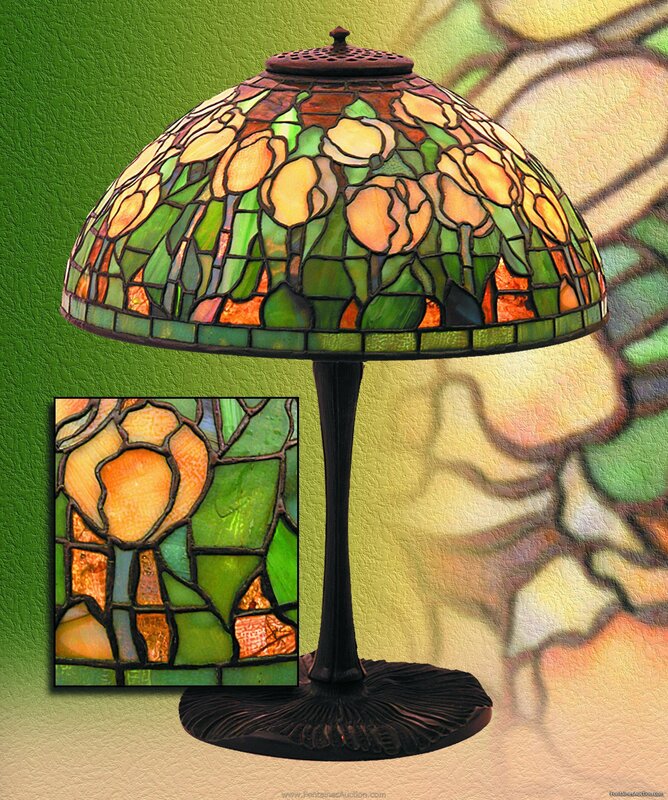 Beautiful in design and intricacy, each Tiffany lamp was made by hand. A major source of inspiration for Louis Comfort Tiffany was nature and the love he had for flowers. Tiffany’s first business venture was an interior design firm in New York City, for which he designed stained glass windows, and doing so he came up with the idea to construct lamps with the remaining pieces from his windows. Although he continued to paint and design for quite some time, Tiffany’s main desire was glasswork. Over twenty years of time, Tiffany designed the many specific styles of his lamps. Most of his luminaries can be grouped into one of seven specific categories, defining their detailed characteristics; the Irregular Upper and Lower Border, Favrile, Geometric, Transition to Flowers, Flowered Cone, and Flowered Globe Lamps. The Irregular Upper and Lower Border lamps carry an openwork crown edge that helps to stimulate a branch, tree, or shrubbery. The Favrile category, which means handcrafted, identifies the first lamps Tiffany made with this label. His initials LCT later replaced the Favrile stamp. The Geometric category speaks for itself. Tiffany used small geometric shapes such as triangles, squares, rectangles, and ovals to form these specific lamps. Next is the Transition to Flowers group, which is subdivided into the Flowered Cone and Globe Lamps. All of these lamps follow a defined nature or botanical design using flowers, dragonflies, spiders and their webs, butterflies, and peacock feathers. The difference between these two smaller categories is that the lamps encompass different shapes, a cone, and a globe. Tiffany’s colleagues included Emarel Freshel and Clara Driscoll; they are known as two of his famed workers. Freshel designed the Wisteria and Pond Lily lamps; Driscoll made patterns consisting of flowers and butterflies for Tiffany lamps. Aside from their categorization, every lamp is prepared by using the Copper Foil method. First, a pattern for the lamp is drawn out on a heavy piece of cardboard. Next, a number and glass color is written on the pattern piece. After the pattern is drawn and labeled, the glass is laid over it and traced. Once the pattern is traced onto the glass, the pieces can be cut and ground to their correct shape; next, the pieces need to be cleaned so the copper foil can be applied to the edges. The copper foil solution allows the pieces to adhere together. After the lamp has been placed accordingly and it is fully bonded, the edges need to be soldered together for a firm hold. Finally, after the lamp has been soldered, it is cleaned to bring out its beauty. Tiffany Antique Lamps and Lighting at Fontaine’s Auction Gallery www.FontainesAuction.com Tiffany lamp. www.barnsandwagner.com. Sept, 2006. Tiffany, Louis Comfort. Tiffany lamp. The Colombia Encyclopedia. Sixth Ed. 2001-5. Neustadt, E. Lamps of Tiffany. Neustadt Museum of Tiffany Art. 1970. Tiffany lamp. www.willowglen.com. 1993/2006.